I find it extremely difficult to verbalise my work. From an academical point of view one can say that my work is extremely figurative. However, this is the manner of my work in which I am most comfortable and I feel I can express myself best. In my work I want to please all the senses but especially the visual and the tactile. 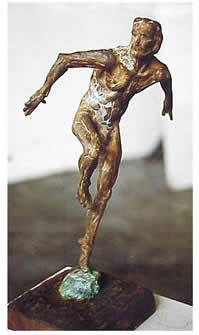 The theme of dancing or moving figures leans itself to movement of light on the roughly modeled surface. Even if the pose is static there must still be a certain energy within the piece. I want the onlooker to feel the need to touch the surface of the sculpture and to 'see with one's fingertips'. If this response is achieved form the viewer, I feel that my work is successful. The ultimate medium, as far as I'm concerned, is bronze, as one's work becomes timeless. The glowing warmth of patina shows little nuance of light and shadow, both intentional and unintentional. As secondary options, I also work in cement fondue and terra cotta.